Hours: Saturdays, 10am - 4pm; Sunday 12pm - 4pm; Group tours Tues and Thurs by reservation. Admission: $3 Adults; $2 students and seniors; children twelve and younger are free; Memberships are available. JGarden Description: Located in Margaret T. Hance Park in central Phoenix, the garden is easily accessible from all parts of the Valley. This recently completed sister-city garden lies on 3.5 acres with a 0.8 acre pond in the middle. It is vegetated with more than 50 varieties of plants that can withstand the rigors of a desert environment. 1,500 tons of rock were handpicked from quarries near Jerome, Superior, Congress and Florence to line the stream beds, walking paths, lakeshore and main lake waterfall. Himeji became a Phoenix sister city in November 1976 and is one of nine sister cities. Phoenix and Himeji participate in business, governmental, cultural and educational exchanges that promote international goodwill and understanding. The Garden is very much a shared cultural vision of the cities of Phoenix and Himeji. Landscape architects from Himeji, Japan made 60 trips to Phoenix and City of Phoenix delegations made 5 trips to Himeji since 1987. Overall, more than 50 architects from Himeji, the sister-city, contributed to the project. 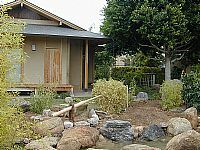 The Garden combined the knowledge and skills of both teams to create an authentic Japanese stroll garden that is adapted to the demands of a desert environment. The total construction cost was $3.8 million by bond funds and an additional $1.0 million from private donations. The name Ro Ho En is a combination of three Japanese words. 'Ro' means Heron, a bird symbol of Himeji City. Shira Sagi Jou, or the White Heron, is a 300-year-old medieval castle in Himeji. 'Ho' is the Japanese word for the Phoenix bird. 'En' means garden.